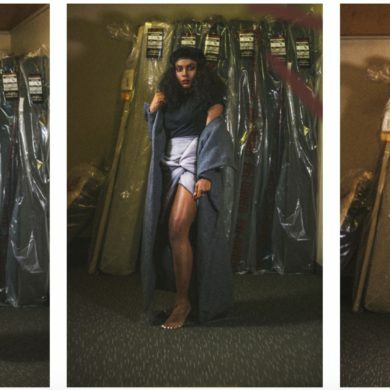 At Fashion School Daily, we’ve been following the adventures leading up to Sara Shepherd’s very own Fashion Week debut. For the insider scoop, we have her design assistant Alyssa Prentice to thank. Well, yesterday was the day when all of their list-making, pattern-cutting and drip-drying paid off! Alyssa’s recount of the show is on its way, but in the meantime, here’s a first look at Sara’s spring 2010 collection including the infamous rub-a-dub skirt once hanging in the shower. As fans of Sara’s designs for some time, we were tickled to see her signature blend of fitted and flouncy out in full force. The effect on the runway was a serious reworking of women’s suiting. In Sara’s vision of power dressing, there would never again be another plain pantsuit or boring blouse. We especially love her sheer peek-a-boo top that’s strategically designed to flaunt but cover up your naughty bits. If you’re lucky enough to have Sara as an instructor, ask her how to make one of your very own.